Barbara wanted a classic Victorian transom for her new sunroom in Montgomery, Texas. This colorful design was created by combining several different design concepts from my Transom Pattern Page. The morning sun shining through the bold colors of this transom should make the room glow. The prism effect from the beveled border and the 6 crystal jewels should flood her sunroom with a rainbow of colors. 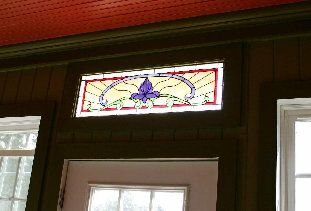 Barbara's Transom measures 11" x 36", contains 117 pieces of glass, and was completed in December, 2006. Another picture of Barbara's Transom taken on a flourescent light box reflecting differently the colors used in this transom. Installed pictures of Barbara's Transom. 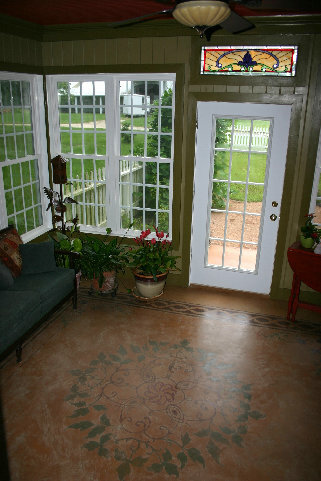 Note the beautiful stained concrete floor that Barbara and her husband created in their sunroom.